Rumi’s quote rings so true for me. 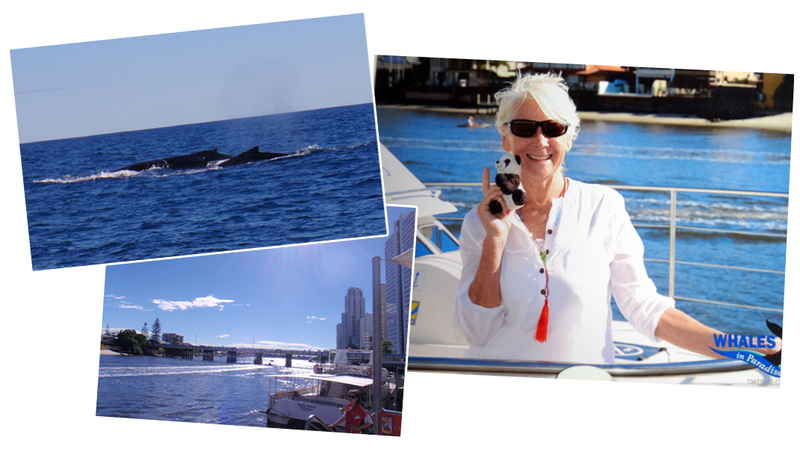 I have experienced a very real mysterious connection, joining a mystical experience I had at the Aboriginal birthing site at Mala Puta, Uluru, and an encounter with a humpback whale, while on a Gold Coast whale watching cruise back in June 2012. The vast contrast in location and culture, in my mind, is as far away as east is to west thus quashing any connection between these two places (Gold Coast and Uluru). On occasions, I remember the urgency I felt to visit the whales on my return to the coast, and laugh out loud, embarrassed by my eccentric weirdo behaviour when I was two nautical miles off shore on the afternoon cruise with Whales in Paradise. My behaviour on the boat is that of a lunatic; a sixty-something year old, white haired woman screaming out loudly to the whales in an unknown foreign phonetic sound. My saving grace was that most of the other passengers were on the top deck, whereas I was on the lower deck closer to water level. Not long after I started screaming out this ancient alien chant whales surfaced, at first in the distance, then coming closer and closer, eventually surrounding the boat. I had been standing alone port side in the same spot for the entire time until a large whale spyhopping at the back of the boat attracts a rush of passengers to the lower deck. I get caught up in the excitement momentarily, and unfortunately I move my position. I say unfortunately because a massive shiny black whale surfaces right alongside the boat where I have been standing. If still in that spot I could have reached out and touched this magnificent creature. The beautiful gift I received was turning around in the perfect moment; we have direct eye contact – a sacred instant – before this gentle giant slips out of sight back into the deep blue ocean. Misty eyed, my voice becomes softer in volume as well as in tone, more a singing chant after this experience. I relax and enjoy the visual playful performances of the many whales’ now breaching, lobtailing and pectoral slapping very near where we are bobbing about. The moon is visible in the late afternoon sky and sunset is fast approaching. Time to return to shore but the boat remains stationary, the captain informing us there is a whale directly under the boat and we will have to wait until it moves away before starting the engines. We are gifted with a colourful sunset of crimson and violet hues mixed with a spec of grey when we eventually return to the mainland. Two years pass but not the memory of the connection I had that day with the humpback whales. During my daily practice of meditation and chanting I connect telepathically with the magnificent whale I had eye contact with. It pops into my awareness when deeply silent and still and we connect and tone together in the sacred centre of the One Heart. Among the thousands of dolphins painted by A.G. and friends – in the Philippines and abroad. 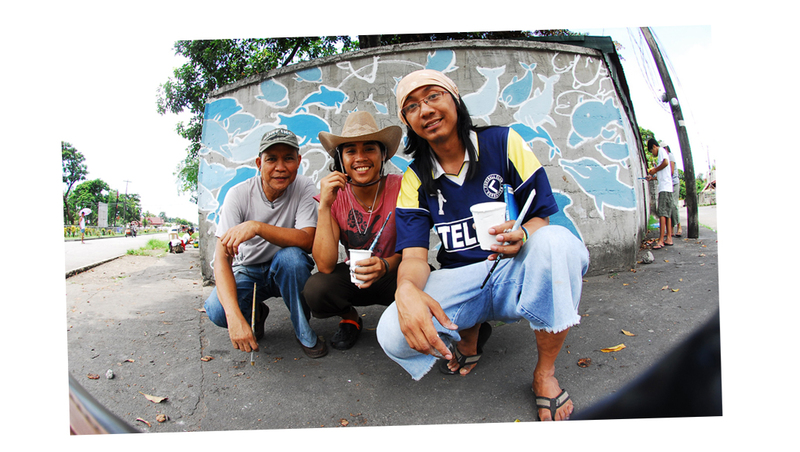 A man who happened to drop by and joined Raz (middle) and A.G.
February 2014. I have the pleasure to finally meet up with a good friend of Raz’s, AG Saño, a Filipino artist, activist and photographer who is visiting Dumaguete on a photo assignment. 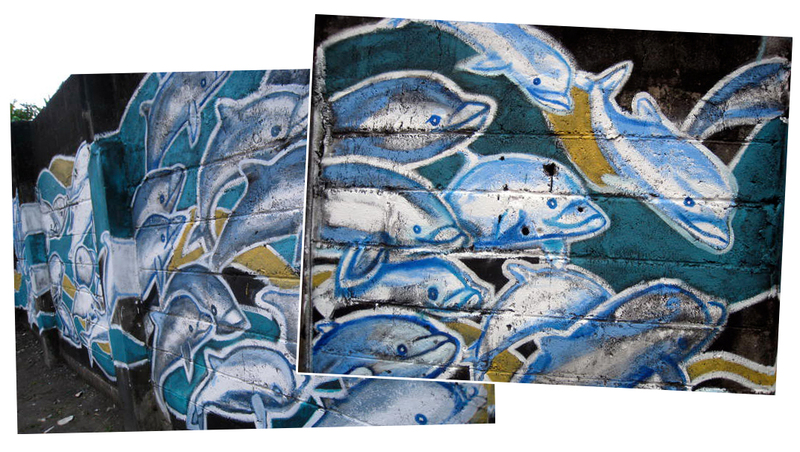 AG is known internationally as “whaleboy”, who after watching a documentary The Cove (about dolphin slaughter in Taiji, Japan) was inspired to paint thousands of dolphin murals as his way of protesting against the violence on these creatures. Chatting over dinner I am reminded of a movie I had watched several years earlier while living in Bali titled “Whale Dreamers”. After our meeting I have a constant nagging feeling I need to re-watch Whale Dreamers, a movie written and directed by Kim Kindersley, narrated by Jack Thompson and with guest appearances from John Hurt, Julian Lennon and Jack Thompson. A ‘light bulb moment’ is revealed while watching this award winning film. A very real mysterious connection to the mystical experience I had at the Aboriginal birthing site of Mala Puta and my extremely outlandish behaviour on the whale watching cruise finally shed a little light, however bizarre it may seem. I cannot explain in words the feeling of inwardly knowing that I was a messenger that day – between the ancient elders of this sacred land at Uluru and the magnificent marine mammals of the ocean – the Humpback Whales. Why am I sharing this? I sit and ponder this question at length…. Am I coming from an ego persona wanting attention, grandstanding my experience or from a genuine feeling of sharing; my intension is to cultivate conscious awareness of how imperative it is to highly respect, protect and recognize the important role and function that these Mystical Marine Mammals agree to undertake; to calm and soothe the Earth with their song, the sound frequency and vibration being upgraded each year with a new tone/tune, balancing the negativity our humans minds spew out constantly. Russ Ligtas is a visual and performance artist who is actively involved with the campaign to stop the dolphin slaughter in Japan. He uses performance art to draw attention to the campaign. He visited the site in Japan and did a performance as tribute to the dolphins and as awakening for the humanity to end the cruel practice. 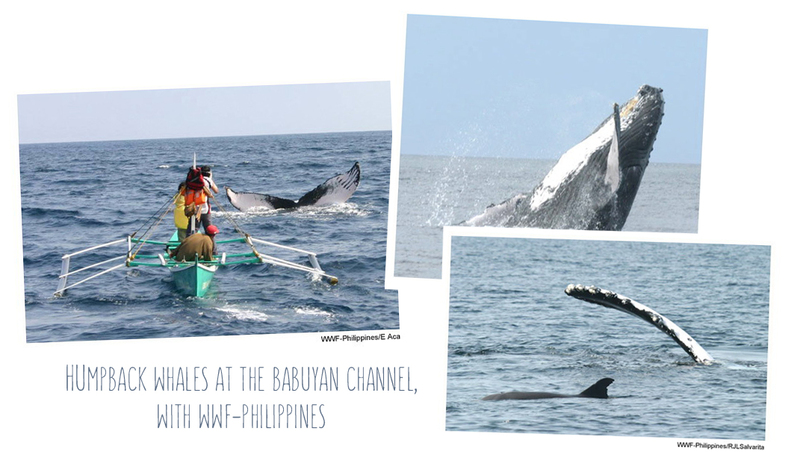 With the research team by WWF-Philippines (Humpback Whale Research and Conservation Project – Babuyan Islands). Small boat encounter with Raz and A.G. on the boat (photo by E. Aca); humpback whale doing half-body breach; flipper slapping with dolphin close by.